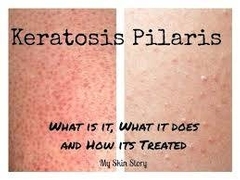 Keratosis Pilaris is a common issue in which dead skin cells block hair follicles, thereby trapping the hair and causing red bumps. The bumps can sometimes become inflamed and appear red in color. Often seen on the arms and legs, this condition can be coupled with dryness. So how does one treat this condition? Exfoliate and Hydrate. Use a textured buffing cloth with an exfoliating body scrub in the shower every other day. Then, at least two times a week, sweep a natural bristle, dry body brush gently over your skin. After, stand in a warm bath and exfoliate your skin using a combination of mineral salts and ready-blended aromatherapy oil. Once you have massaged this over your whole body (excluding the face) lie down and enjoy a warm soak while the mineral salts continue to nourish the skin and the oils leave you silky soft. As soon as you get out of the shower or bath, apply a hydroxy acid-based body moisturizer to damp skin, which will both trap precious hydration and continue to gently slough dead cells. This routine will gradually help to unplug the follicles, allowing the hair to grow naturally. Improvements can be seen within about one week!